Attendees of the Traditional Building Conference or our webinars will receive a free subscription to Traditional Building magazine. 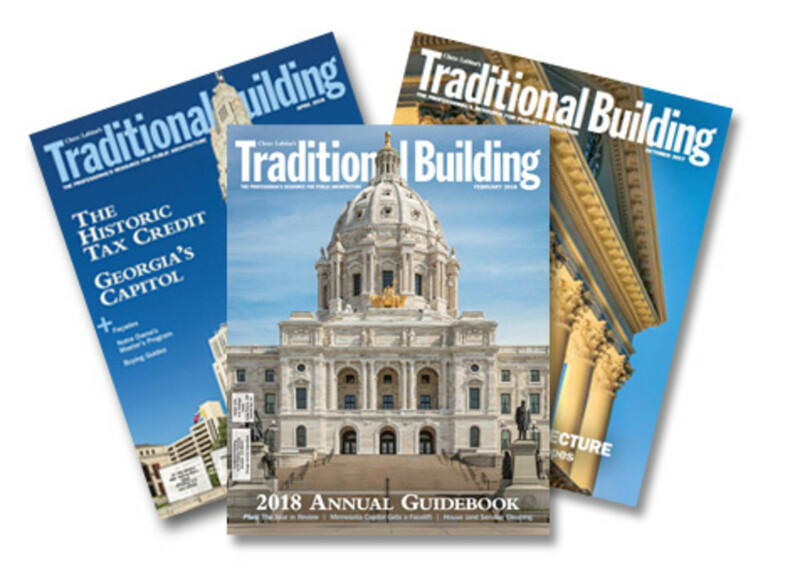 Traditional Building is your one-stop resource for all things traditional, featuring hard-to-find companies and products, profiles of leading architects, classic building techniques, books reviews and more. Get Traditional Building delivered to your door 8 times a year. We’re the industry’s top resource for architects, builders and designers. Find new companies, learn classical building techniques, and read about the latest in traditional architecture, building and restoration. Start your subscription now! Founded in 1988 by Clem Labine, founder of Old House Journal and Period Homes magazines, Traditional Building is the only magazine that focuses on traditional design in public architecture. The magazine and the website are read by architects, contractors, facility managers, developers, artisans and interior designers. Our articles highlight historic preservation, adaptive re-use and new traditional design for commercial, institutional and government buildings – as well as civic spaces and landscapes. Product guides, articles and photo galleries provide the latest information on how to specify and locate historically inspired products such as windows, doors, lighting, columns, hardware and related services. In addition, noted authors and designers discuss current professional issues, such as conflicts between modernism and traditional design as they affect architecture and urban design. Energy efficiency, sustainability and successful urban design are also important topics of discussion. The only national awards program honoring traditional architecture, the Palladio Awards were launched in 2002 and have cited more than 100 projects for their exceptional design. Categories include both restoration and renovation and new traditional design. These are selected by a jury of architects, educators and designers and are featured each year in our June issues. Products are the lifeblood of any restoration or renovation project, and Traditional Building is a comprehensive source of information on hard-to-find traditional products and services--products such as hardware, lighting, columns as well as services such as decorative painting and window restoration. Every issue includes at least a dozen of these Buying Guides.